The same scale, from purely cultural to distinctly political nationalism, can be found among the nationalities of the Austrian Empire. Metternich, more than the emperors themselves, Francis I and after his death in 1835, Ferdinand I, who were rather weak and insignificant rulers, represented the idea of absolute government. He was hardly afraid of the cultural revival of the Czechs in spite of its steady progress. The foundation of the Museum of the Bohemian Kingdom in 1818 was indeed rather an expression of interest in regional studies. But when in 1830 the Matice ceska (literally “Czech mother”) was attached to it, that society also started encouraging the use of the Czech language. And it was obvious that the publication of Frantisek Palacky’s History of Bohemia (though first in German), covering the period of independence before Habsburg rule, would revive a national tradition in complete opposition to all that Metternich was standing for. Some of the most prominent Czech writers, like the poet Jan Kollár and the historian P. J. Safarik, were of Slovak origin and interested in the past and the culture of all Slavic peoples. They contributed on the one hand to a feeling of Slavic solidarity in the Habsburg Empire, long before that movement was exploited by Russian imperialism, and on the other hand to a national revival even of those Slavs who never had created independent states, like the Slovenes and the Slovaks themselves. Though very close to the Czechs, the Slovaks under the leadership of Ludovit Stur decided to use their own language in literature, thus reacting against the backward conditions in which they were left under Hungarian rule. Trying to play off the various nationalities against one another, the Metternich regime, for instance, would use officials of Czech origin as tools of Germanization in Polish Galicia, and would welcome the growing antagonism between the Magyars and the other groups in Hungary. In that kingdom, whose state rights even Metternich could not completely disregard, Hungarian nationalism was making rapid progress, particularly in the cultural and economic field, thanks chiefly to Count Széchenyi, called “the greatest Hungarian,” who in 1825 founded the Hungarian Academy of Sciences. The Diet, which continued to function though with greatly reduced power, was slow to carry out the democratic reforms advocated by Széchenyi, but in its session of 1843 - 1844 it at last decided to replace Latin by Magyar as the official language. At the same time the Hungarian Diet also decided to prescribe instruction in the Magyar language in the schools of Croatia where, therefore, Croat nationalism was more alarmed by the inconsiderate pressure coming from Budapest than by the centralization of the whole empire being promoted in Vienna. Furthermore, under these conditions, the idea of Yugoslav unity, in spite of the old antagonism between Serbs and Croats, was also becoming popular among the latter where the gifted writer and politician Ljudevit Gaj (1809—1872) propagated the “Illyrian” movement and also influenced the Slovenes in a similar sense. Even in its rather modest beginnings, that movement was dangerous for the unity of the monarchy because it could not find full satisfaction within its existing boundaries. And such was also the case of Polish and Italian nationalism, as well as of the Ruthenian and Rumanian aspirations. The former clashed in eastern Galicia with Polish supremacy, and the latter in Transylvania with Magyar supremacy, while cultural ties were at least established with the Ruthenians or Ukrainians of the Russian Empire, and with the Rumanians in the Danubian principalities. 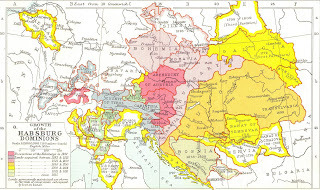 But even more than these international implications, the two big national problems which affected the Austrian Empire alone, the Czech and the Magyar, were a growing source of tension because in these cases modern nationalism found strong support in the historic tradition of two medieval kingdoms. The Pan-Slavic trend among the Czechs was ready to use the Habsburg monarchy as a basis of action, and the Hungarian program did not exclude a dynastic union with Austria. But even so they were directed against the very foundations of Metternich’s system and could not be represented by the chancellor’s police measures.